ISLE OF MAN – Microgaming’s iconic superspy makes her triumphant comeback in Agent Jane Blonde Returns, developed exclusively for Microgaming by Stormcraft Studios. Marking her first appearance since the hugely popular 2005 debut, the audacious Agent Jane Blonde is pulled out of retirement for another action-packed assignment in this five-reel, 15-payline online slot. Fully loaded with shimmering neon graphics and an atmospheric, retrowave soundtrack, Jane is on a top-secret mission to infiltrate a shadowy organisation, pursuing stacked wilds and respins along the way. Visually rich reels are kitted out with symbols depicting Agent Jane’s car and collection of gadgets, while four of her masterful disguises appear as high-paying symbols. Maximising potential wins throughout the base game, the adventurous superspy breaks cover to act as a wild symbol, which can be stacked for enhanced winning combinations. Successfully landing two scatter symbols will activate the Respin feature, where wilds drive the action. The landed scatter symbols transform into wilds and remain locked in position during the feature. Locking additional wilds in place during successive respins can grant players the opportunity to pursue colossal wins by potentially extending the feature until all five reels are filled with wilds. Now reporting for active duty, Microgaming’s favourite secret agent is ready for another mission in Agent Jane Blonde Returns, which is deploying exclusively to Microgaming operators. ETA: Tuesday 26 March. Agent Jane Blonde Returns marks a victorious comeback for Microgaming’s celebrated superspy. Stormcraft Studios have excelled in delivering a stylish slot experience, offering new and returning players the chance to dive undercover alongside our leading secret agent for a rewarding new adventure. High-action gameplay is enriched with lavishly designed graphics and a breathtaking synthesizer soundtrack, which dynamically alters to enhance the heightening drama. So much has changed since Agent Jane Blonde was created in 2005, and we are thrilled to be bringing her out of retirement in this carefully crafted and beautifully realised game. 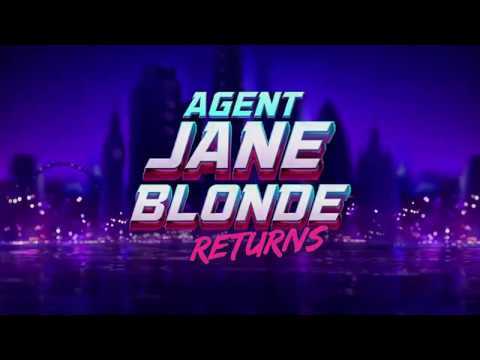 Agent Jane Blonde Returns is all about action, with the high frequency of the feature ensuring an elevated level of entertainment for both new and advanced players. The user experience is very important to us at Stormcraft Studios and we focus on ensuring that synergy is achieved between the mechanics and the audio-visual experience of the game. We are looking forward to sending Agent Jane Blonde out on her new mission.